Have you ever wondered how chiropractors deal with lower back pain? It is intriguing to many how we would treat our back pain and if we would use the very methods we prescribe. Before I go into my recommendations for dealing with pain in the lower back, I have to say that back pain is a great equalizer. It cuts across all professions, social classes, and ages. In fact, about 80 percent of Americans will experience lower back pain in their lives. As a chiropractor, I am behind prevention and looking at pain from a holistic point of view. Lower back pain is usually spurred on by a slip, a fall, holding the wrong position for a long time, or handling heavy weight. As you age, your bones also become more brittle making you susceptible to this pain in this location. This doesn’t spare those even those in the medical community. Even us chiropractors get them. I have experienced and dealt with lower back pain in the past, and if I am not careful, it can come back. Let me share with you some ideas on how to prevent and address the pain, hoping it can help you avoid and resolve yours. Having a healthy spine is a sign of good health. If you want to maintain a healthy spine, pay close attention to your posture. 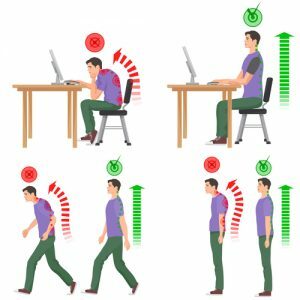 When you find it necessary to be on your feet for extended lengths of time, keep the load off your lower back by planting your left or right foot slightly ahead of the other and bow somewhat at the knee. Also, shift your weight from your left foot to your right foot and from your toes to your heels and vice versa. Avoid pushing your head forward or leaning it to your left or right when standing. Your shoulders should line up with the lobes of your ears. Sit back, straighten your spine, and maintain the natural curve in your lower back. Keep your head up and avoid slouching at all costs. Invest in a proper work table and chair to help you to maintain appropriate posture. Get up from time to time, say after every 30 minutes. You can stretch, make yourself some tea, or go up and down the stairs. 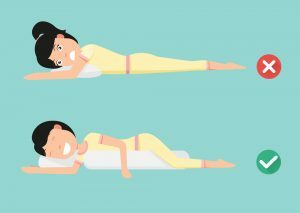 Shun the idea of sleeping on your backside as this does nothing to alleviate spinal pressure. If there’s no more comfortable position, arrange a pillow beneath your knees to minimize tension to your lower back. Lying on your side, place a pillow between your knees. If it hurts in the morning, chances are, you’re probably using the wrong pillow. Invest in proper pillows for sleeping. When using your phone to text, bring up your arms in front of your eyes and avoid looking down. When you’re on a computer, make sure to use your eyes to look up or down, left or right, and not bring your head down and hurt your neck. Use earphones to reduce the muscle strain of having to hold your phone between your ear and shoulder. If you neglect proper posture, you will surely pay for it later on. When you feel pain in your lower back, despite the location it is more likely due to a problem with your spine. If you neglect to take measures to maintain proper posture and allow yourself to sit for long hours you are going to pay for it later on. Our lower back muscles must rotate and flex, which is why stretching and light exercises are a vital part of preventing and managing back pain. If your lower back starts hurting, it will usually begin to feel better after 48 hours with stretching, exercises, and some adjustments. Make sure to get moving the moment pain hits. According to John Sarno, MD, professor of clinical rehabilitation medicine at New York University, pain stems from buried emotional issues that trigger tension in the body. The stress deprives nerves and muscles of oxygen. Relief comes from learning how to deal with and overcome negative emotions. Dr. Marilyn Goodman, BSN, BSA, DC says, “Being a chiropractor, I treat pain as my body’s signal that I should give more care to myself, move a little more, and take the time to de-stress.” We all need time to de-stress and take care of ourselves more. Not many realize what damage is done to your spine health when there is much worrying involved. Pain is your body’s warning sign about your spine health. If you are active and maintain proper posture and you are not stressed you are going to keep pain at bay. To learn more about preventing back pain from coming back and how to efficiently manage it holistically and not through the use of medicine, then visit a chiropractor’s office now. Copyright © 2019, A Conversation About Your Family’s Health. All Rights Reserved.